Fed up having to read your Facebook messages? Would you prefer it if they were whispered in your ear by the pleasant voice of a young woman? There’s an app for that. 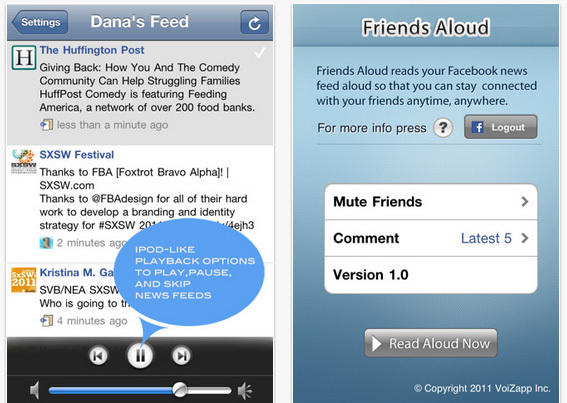 Friends Aloud is an app for iPhone that will read out your news feed posts and comments to you, saving you the hassle of pulling your phone out and looking at it. It can read out as much or as little as you like.. So far there only seems to be one voice for the app – a “pleasant, easy-to-understand young woman’s voice”. But we hope that – like with the Tom-Tom – there will be a range of voices to choose from, maybe celebrities will lend their voice to this app and you’ll be able to hear about your friend’s Sarah’s Saturday night in the voice of Snoop Dogg or Tom Cruise. Just a thought. They claim their text-to-voice technology is state of the art. We can say for sure that text to voice always works much better than tech which goes the other way and turns people’s speech into written words – speech recognition is still pretty bad. The free version is ad-supported, while the ad-free Pro version is $2.99. This one is for the lazy dogs out there..FTW!